Vancouver, British Columbia – December 4, 2018 – PPX Mining Corp. (the “Company” or “PPX”) is pleased to announce that it has received the results of an independent Pre-Feasibility Study (“PFS”) for an integrated underground mine and gold-silver recovery plant at the Company’s Igor Project in Northern Peru. The PFS was prepared by Mine Development Associates (“MDA”) of Reno, Nevada in accordance with the requirements of Canadian National Instrument 43-101 “Standards of Disclosure for Mineral Projects” (NI 43-101). Unless otherwise noted, the results below are expressed in US dollars, Canadian dollars are converted at an exchange ratio of 1.33. Pre-tax Internal Rate of Return (“IRR”) of 64% at $1250/oz gold and $16.50/oz silver, 59% post-tax; 76% pre-tax IRR with $1350/oz gold and $17.82/oz silver prices, 71% IRR post-tax. Average Life of Mine (“LOM”) cash operating costs of $601/oz gold equivalent (“AuEq”) recovered and all-in sustaining costs (“AISC”) of $813/oz gold equivalent LOM. 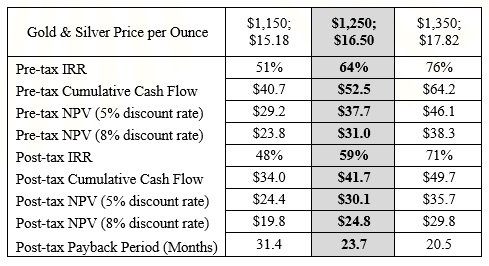 Pre-tax Net Present Value at a 5% discount rate (“NPV-5”) of $37.7 million (Cdn$50.1 million) at $1250/oz gold and $16.50/oz silver, $30.1million post-tax; $46.1 million pre-tax NPV-5 (Cdn$61.3 million) with $1350/oz gold and $17.82/oz silver prices, $35.7 million post-tax. The Callanquitas underground mine is fully permitted and has been operating for over 18 months in a test mining and bulk sampling mode. 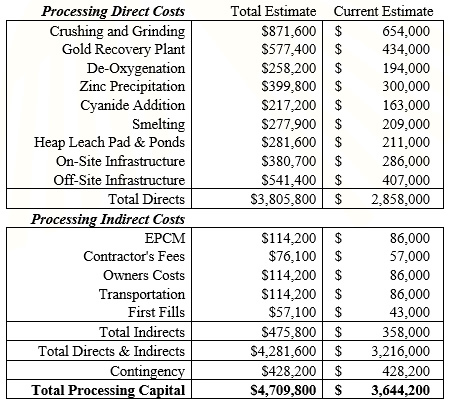 The heap leach processing facility has nearly completed the permitting process, needing only the final Permit to Initiate Operations (“F2”) to begin operations. This permit is expected in December, 2018. With the completion of the PFS, the Company is prepared to advance the Igor project into production as outlined in the PFS. PPX looks forward to completing our transition from developer to producer and becoming Peru’s newest gold and silver producer. Operating costs are subdivided into direct cash operating costs and All-In Sustaining Costs (“AISC”) which include capital, reclamation, and payments to RIVI Capital for the stream financing. The PFS projects direct cash operating costs of $601/AuEq ounce and AISC of $813/AuEq ounce which would place the project near the lower quartile globally in terms of operating costs (based on World Gold Council GoldHub Q3 2018 Production Costs AISC Chart). MDA developed the update mineral resource estimate for the Igor Project that has been utilized in the PFS in accordance with the requirements of Canadian National Instrument 43-101 “Standards for the Disclosure of Mineral Projects”. The resource estimate is restricted to the Callanquitas gold and silver deposit within the Igor Project. 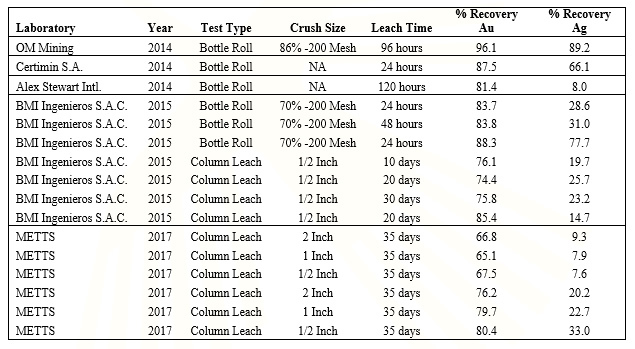 Data from a total of 93 diamond core drill holes totaling 23,264 metres in length and 1,126 underground channel samples were used to prepare the resource estimate. The estimation methodology included establishing separate domains for higher and lower grade portions of the Callanquitas deposit, utilizing geologic criteria including structure to constrain resources. Individual model blocks are 0.5m x 2.0m x 2.5m in order to mimic the proposed and current mining method. The Inverse-Distance Cubed (“ID3”) method was used to estimate sample data into the block model. As-built surveys of underground workings were used to eliminate resource blocks that have already been mined as of October, 2018. A gold equivalent (“AuEq”) cutoff grade of 2.0 gpt AuEq was used to define the reported Mineral Resources. Mineral resources are not mineral reserves and do not have demonstrated economic viability. There is no certainty that all or any part of the mineral resource will be converted into mineral reserves. 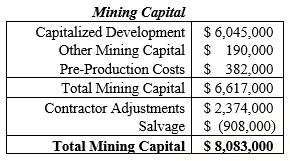 The results of the mineral resource estimate are summarized below. PPX Mining Corp. (TSX.V: PPX.V, SSE: PPX, BVL: PPX) is a Canadian-based exploration and development company with assets in northern Peru. Igor, the Company’s 100%-owned flagship gold and silver project, is located in the prolific Northern Peru gold belt in eastern La Libertad Department. PPX is developing the Callanquitas Mine and heap leach facility to exploit high grade, underground-minable gold and silver ore. Based on the Company’s Prefeasibility Study, PPX expects the Callanquitas mine to produce up to 26,000 AuEq ounces per year over a seven-year mine life at cash cost of less than US$610/AuEq ounce. Simultaneously, PPX is accelerating its exploration program at Igor in order to fully evaluate the resource potential of the entire Igor project area. The Callanquitas structure is open along strike and at depth, parallel structures are unexplored. New discoveries at Portachuelos, coupled with the Domo and Tesoros exploration targets, emphasize that the Igor Project is evolving into a district-scale project with multiple deposits and mineralized zones.